I was given the opportunity to review yet another great product!! This time it was the DVD Money and Making Change from Rock 'n Learn. I really liked this DVD and so did all of my children. The songs were catchy and the video was amusing. Even though making change is over my twins’ heads they still watched along and danced to the music. It’s never too early to get them familiar with money. My 9 year old, who already knows how to make change also enjoyed it. It was a great reinforcement of what she already knew and I’m pretty sure she learned a few tips and tricks too! Buy it: With the holidays approaching, Rock ‘N Learn wanted to offer their customers a 25% discount coupon. When placing an order through www.RockNLearn.com, customers can use the code SSA25 at checkout to receive the discount. The coupon code will be good through December 5. They have several DVDs to choose from! Also right now they are having an Ultimate Giveaway. They will be giving away an entire collection of all of their DVD's! Go enter the Ultimate Giveaway here. 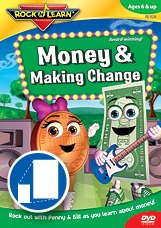 Rock 'n Learn is giving away 1 free Money & Making Change DVD to one lucky TwinkieMommie reader! *I received a Money & Making Change DVD from Rock 'n Learn for review purposes. I received no other compensation for my review. The opinions in this review are my honest opinion. On Houston Patenting Website I read the review about the Any Book Reader by Franklin and I have to say that is a have to have. There is a benefit to the fact you dont have to buy special books, it can be any book your kids like. The price was good too. I would love to get one of these for my son, it would keep him busy for a while just from library books! Tweeted about the giveaway jeaniejcullip! Congrats "a woman" you won!! Rock n learns DVDs are really rock. I was used it for my kids, & it works beautifully, my kids like these DVDs so much. Now I’m using fit4-future’s Educational DVDs for my toddlers. These are also wonderful, with that my kids can learn basic mathematics workouts like learning subtraction, maths counting etc. they also has some timetables games for kids. I think these kinds of DVDs are helping kids to make their learning simple.